As a kid, my mom loved weird candy. Every February we had a bowl of pastel-colored hearts in the kitchen. You know those candy hearts that taste like chalk? I am convinced that no one actually buys them. They just magically appear all over the place. My mother is the only human I have ever met who actually enjoys them. It’s gross. I did a quick google search and discovered that I am on to something. Apparently, they are making far less of the original sweet-hearts than they used to! It has caused a shortage! I guess that is just another thing to blame on millennials. However, they were readily available all over my town. Just because the original company stopped making them, there are still plenty of other brands who put them out in mass-supply. These candies are the definition of nostalgia. They immediately make you think of valentines day! However, they are really gross. So why not find a better use for them? 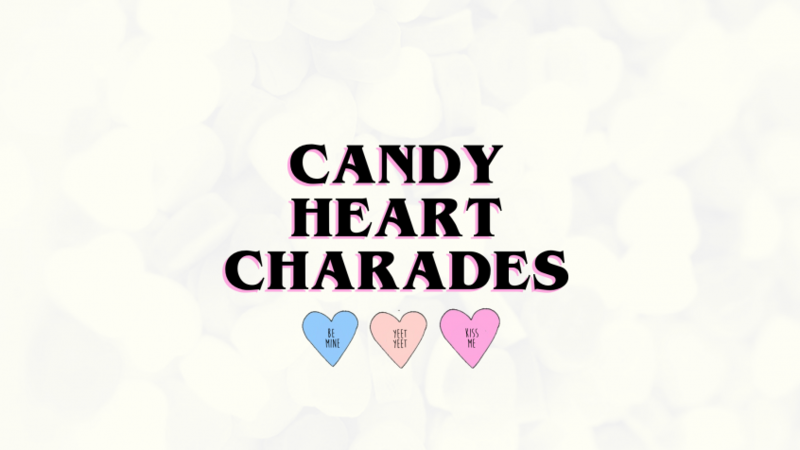 I present to you — Candy Heart Charades! This is one of the easiest games you will ever put together. All you need is a bag of candy hearts, a couple volunteers, and a screen to project the title-slide. 1. Call up two volunteers. 2. Have one student pick a random heart from the bag. (We went though and sorted out the funniest & most legible). 3. They have 60 seconds to act-out what their candy heart says. (No words! This is charades). 4. When someone in the crowd guesses right, they get a point. 5. Person with the most points (out of 7) wins an over-sized candy bar or some other valentines-themed prize. You can download the game bundle below! As a bonus, we made a few screen graphics of famous conversation-heart slogans if you cannot find them due to the shortage. If you go this route, simply reverse the game. Have the crowd act it out while the students up front guess.